A tap on the Mail app’s Start screen tile brings the Surface’s Mail app to the screen. Even if the Mail app is already running in the background, a tap on its Start screen tile brings it front and center. Left column: The name of your currently viewed e-mail account appears in the top; that account’s folders appear below its name. (You’re currently viewing the highlighted folder.) At the column’s bottom, you see names of any other e-mail accounts you’ve set up. To view mail from another account’s mail, tap that account’s name. Middle column: Tap a folder from the left column, and a list of that folder’s e-mails appears in the middle column. There, you see the sender’s name, the e-mail’s arrival date, and the subject name. 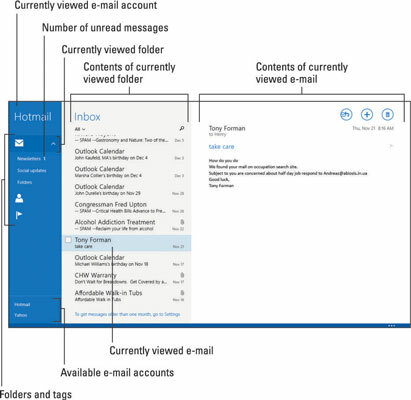 Right column: Tap an e-mail listed in the middle column, and its contents spill out in the right column. From the left column, tap the account and then the folder you want to browse. When you tap the folder, its contents appear in the middle column. From the middle column, tap the e-mail you want to read. The message’s contents spill out into the right column. Can’t read an e-mail’s tiny letters? Then put two fingers on the screen to stretch or pinch it until it’s the right size for your eyes. Inbox: When you open the Mail app or switch between accounts, you always see the contents of your Inbox — the holding tank for newly received messages. The Mail app only shows your last few weeks of messages. Favorites: Tap this area to see e-mail from people you’ve marked as Favorites in the People app. Flagged: To mark an e-mail for later attention, flag it: Slide your finger inward from the screen’s top or bottom edge to fetch the App bar, and then tap the Flag icon. The Mail app stores flagged messages here for easy access. Like all apps, the Mail app hides its menus. To reveal them, slide your finger inward from the screen’s bottom or top edge. Slide up from the bottom, for example, and the App bar appears, with all the app’s menus in tow. The App bar is context-sensitive, meaning it changes to show icons relevant to what you’re currently viewing.